Driving north up the Thika highway from Nairobi and that familiar feeling of excitement settles. I must have driven this route hundreds of times but leaving the dual carriageway for the scenic single lane up to Mount Kenya and beyond is a journey I’ll never tire of. Mangoes in Sagana, the ever-chaotic town of Karatina, young guys on the roadside selling sacks of miraa… Climbing higher and higher in altitude the temperatures become colder. Past Lewa Conservancy, down, down, down towards the dusty, desert heat of Isiolo, the land of Boranas, Turkanas, Samburus, Rendilles, closer to the wilds of northern Kenya. A few hours north of here and the edgy city life of Nairobi is but a distant memory. Samburu National Reserve is one of my favourite places in the world. 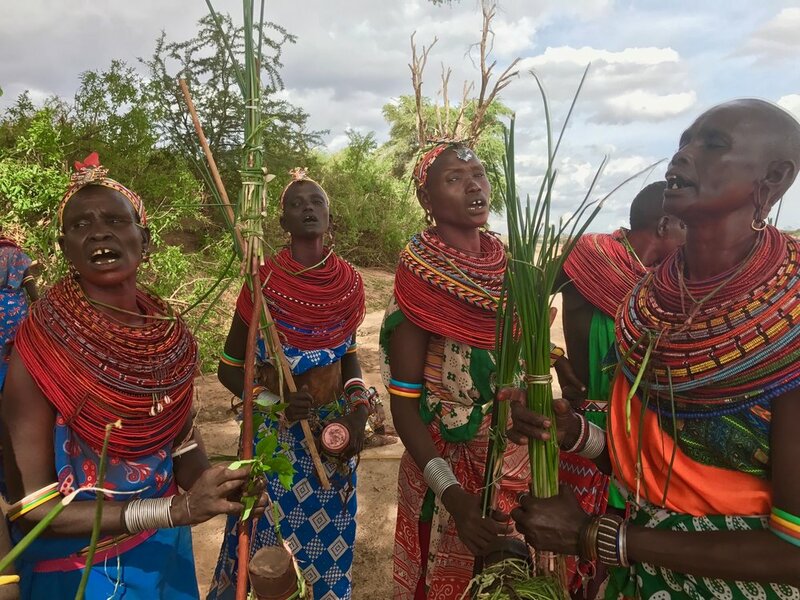 As well as the Lenkiyio Hills – the heartland of the Samburu people and a region where time has virtually stood still and embalmed it in the sort of natural beauty only found in areas of extreme remoteness. No roads, no mobile phone network, no light pollution… just endless hills, green valleys, mountain streams, wazee (old men) who walk tens of miles to reach neighbouring villages or Thursday’s market day. This is a place of folklore, where stories are transmitted by word of mouth and the legendary ngambit lives deep inside the forests (a fictional creature – perhaps). Samburu manyattas (homesteads) exist as they’ve done for hundreds of years, houses made of cow dung, ash, and earth and filled with smoke from the little fires kept burning inside. There are a handful of lodges but mobile camping is our favourite way to connect to nature here. Samburu National Reserve is one of the best places on the continent to spend quality time with elephants. Comparatively, they are less nervous of humans here and tolerant of being observed up close. Watching them cross the Ewaso Nyiro River - stopping in the shallows for mud baths and keeping their young closely protected along the way - is surely one of life’s greatest privileges. But there is more to it than this. Perhaps it’s the omnipresence of sacred Mount Ololokwe which seems to keep a watchful eye over the reserve, the symbiosis of nature and people, the doum palm groves which parch under the sun, the flash of red as a Samburu moran passes through on foot… but the area is enchanting and deeply stirring. The long rains bring colours of utter spectacularity. Twilight in particular with its brilliant orange and lilac streaks against a petrol blue sky. For the luxury market there is little at the very top end accommodation-wise. Saruni Samburu has spectacular views but is a long drive from the action of the river. Sasaab has a beautiful position on the Ewaso Nyiro and we love its remoteness and close access to some of the cultural highlights of the area. However, the drive to Samburu National Reserve is long so we prefer this as a cultural experience and base from which to explore northern Kenya by helicopter. For those seeking more of an adventure there are some excellent camping experiences – simple but authentic and led by wonderful, warm people with incredible knowledge of the area. A takeover of Lion King Bush Camp offers the opportunity to experience genuine Kenyan hospitality at its best, a stunning riverfront location, Samburu storytelling round the fire and to be hosted by one of the most knowledgeable people in the region. Contact us at info@anotherafrica.com for further information. The great migration has finally arrived in Kenya where the Mara River takes centre stage each year for one of the world’s greatest wildlife spectacles. The Masai Mara boasts the highest concentration of wildlife in Kenya and is a wish list destination for most first-time safari travellers. Yet there are many other regions to explore and some, where unlike the Mara, you’ll barely see another soul during your visit. 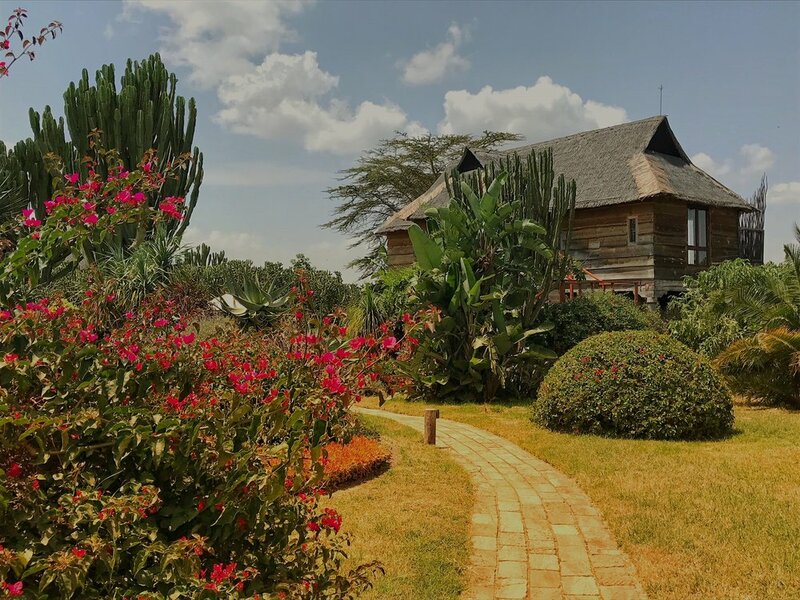 Against the backdrop of Mount Kenya, Laikipia is largely comprised of private ranches and conservancies, and offers some of the most exclusive accommodations in the country. Segera Retreat is one of these – a 50,000-acre eco-ranch belonging to Jochen Zeitz, philanthropist, conservationist and founder of Cape Town’s Zeitz MOCAA. “Retreat” summarizes Segera perfectly. There are seemingly endless plains of honey-coloured grasses still long from this year’s abundant rainy season and accented by whistling thorn acacias. The entrance to the lodge is quite inconspicuous. No immediate sign of the exquisitely-planted tropical gardens, compelling collection of art and artefacts, sumptuous villas and beautifully-appointed spa. Yet this is Kenya’s most sophisticated lodge and they have spared no expense where the finest details are concerned. Guest interaction is measured with precision and private dining throughout the property means they completely avoid the communality which isn’t usually favoured by guests travelling at a certain level. Each villa has its own housekeeper, wildlife guide and assigned waiter, so the same questions need never be asked twice. Even before you’ve stepped through the doors everyone knows your name by heart and extends the welcome one might expect for a friend or guest of many years. There is just the right balance between distance and familiarity. Jens Kozany is a superb General Manager and his approach to hospitality aligns him with the very best in the industry. With an amazing ability to make everything seem completely effortless, nothing is ever too much trouble, there is no such word as “no”. Location-wise Segera is well-placed for helicopter trips to Mount Kenya, Lake Turkana, the Suguta Valley and Matthews Range and we particularly recommend sequencing it at the end of a trip to unwind and completely self-indulge. Contact us at info@anotherafrica.com to plan the ultimate Kenyan wildlife and cultural experience. Once a thriving safari destination, Zimbabwe’s political instability and dire economy under Mugabe’s rule didn’t exactly do any great wonders for its appeal. However, over the last few years it has started to emerge once again, most significantly in 2016 when Mugabe reopened Victoria Falls International Airport. Although tourists already flocked in droves to see the falls from the more impressive Zimbabwean side, this really helped put it back on the map. The international press were hot on the heels of the country’s latest upscale tourism developments including the openings of Wilderness’s Little Rukomechi in Mana Pools and Matetsi Lodge near Victoria Falls. Fast forward a couple of years and Singita Pamushana is due to reopen this month following extensive renovations and the addition of two new two-bedroom suites. Another of our favourite safari brands, Great Plains Conservation, are soon to open Mpala Jena Camp and Mpala Jena Suite on a private concession within the Zambezi National Park. They are also launching a 6-night exploration safari experience in Mana Pools National Park. So what other reasons should you visit Zimbabwe? This is a country emerging from the ashes in many respects. It has always been a jewel in Africa’s crown but was stifled under a hugely oppressive regime and economic disaster. At long last there is the opportunity to reinvent itself and we’re excited to see what that entails. Galleries such as First Floor Gallery Harare have helped set the scene for independent international contemporary art and we’re certain this will continue to expand and thrive. Already the country's great talent is showcased at world-renowned art fairs such as the Venice Biennale. Zimbabwe Fashion week takes place annually at the end of August, there’s a lively food scene, music, crafts… but most of all Zimbabwe is widely considered to be one of the most beautiful countries on the continent with some of the best guiding. In the northwest part of the country, Hwange National Park is renowned for its elephant population, substantial concentrations of game and for being the largest national park in the country. The mighty Victoria Falls are widely considered to be best seen from the Zimbabwean side due to the greater number of viewing points. Lake Kariba is spectacular and one of the largest artificial lakes in the world. From here the Zambezi continues east through the lower Zambezi valley with Mana Pools National Park to the south - one of Africa’s most exquisite parks and a UNESCO World Heritage Site. Zimbabwe combines perfectly with Botswana and/or Zambia for those with extra time to spare. Please contact us at info@anotherafrica.com to plan something beyond your wildest dreams. True to its name, which translated from Shangaan means “place of miracles”, Singita’s accomplishments are almost implausibly outstanding across the board. There is something very special about landing in Livingstone – a town in southwestern Zambia on the border with Zimbabwe and gateway to the great Zambezi River and Victoria Falls. It immediately feels like a journey back in time where something spectacular is about to unfold. An hour or so upstream from Victoria Falls, the last part of the journey down a dirt track road, and we reach Royal Chundu – a remote, privately-owned property made up of two lodges – River Lodge and Island Lodge. The latter is the more exclusive of the two with four very private suites on Katombora Island, accessed by boat and overlooking a scenic waterway of the Zambezi River. Benefitting from more spacious open plan suites, Island Lodge has the higher price point, which in our view is well worth it for the sheer privacy. Best of all is to take over all four suites for a family or group of friends and feel like you’re staying on your own private island complete with dedicated staff. Either way, the setting of both lodges is spectacular. At River Lodge you have front-facing views of the Zambezi River, a vibrantly-coloured lounge and dining area, and attractive swimming pool with deck and sun loungers. The ten suites are smaller than those at Island Lodge, and without the freestanding bath tubs on the sun decks, but with equally pretty views. As dusk draws in, with indescribably beautiful dusky purple skies and the sounds of hippo in the distance, the real magic starts to illuminate. Where they really score at Royal Chundu is with a team of some of the most delightful people you could wish to meet. We were greeted every day by the warmest of smiles amongst staff who went above and beyond to ensure we were happy. Particularly impressive is Lodge Manager, Aggie Maseko Banda, who has what can only be described as a completely natural flair for hospitality. The sort of person who knows instinctively when to be around without being intrusive or overbearing. This is a fine art and actually quite rare on the safari circuit which is designed to have you programmed to set schedules (something we try wherever possible to avoid). We particularly loved our canoeing experience which began at the Katombora rapids and continued through the channels of the Zambezi past endless jackalberry and baobab trees. The island lunch they set up for us at the end of the trip was spectacular and a definite highlight of the trip. Not to mention the exhilarating 30-minute helicopter ride over Victoria Falls and down into Batoka Gorge (well worth doing this and not the shorter, 15-minute version).